Minnie Mouse Dream Party Birthday 9" Square Lunch Plates, 8ct. Home»BIRTHDAY»Minnie Mouse Dream Party»Disney Minnie Mouse Dream Party Birthday 9" Square Lunch Plates, 8ct. Time for a Minnie celebration! 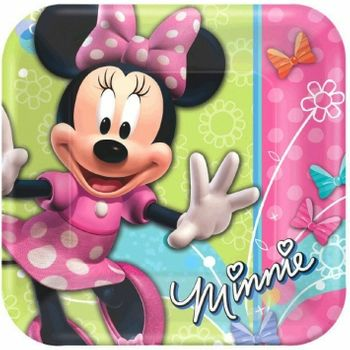 Our Minnie Mouse Lunch Plates feature Minnie in a pink dress on a green, blue and pink background. With Minnie's very own signature in the corner, Minnie Mouse paper plates add a touch of magic to your Disney party.